create-window The ::create-window signal is emitted when a detachable tab is dropped on the root window. page-added the ::page-added signal is emitted in the notebook right after a page is added to the notebook. page-removed the ::page-removed signal is emitted in the notebook right after a page is removed from the notebook. page-reordered the ::page-reordered signal is emitted in the notebook right after a page has been reordered. switch-page Emitted when the user or a function changes the current page. The Gtk.Notebook widget is a Gtk.Container whose children are pages that can be switched between using tab labels along one edge. The Gtk.Notebook implementation of the Gtk.Buildable interface supports placing children into tabs by specifying “tab” as the “type” attribute of a <child> element. Note that the content of the tab must be created before the tab can be filled. A tab child can be specified without specifying a <child> type attribute. To add a child widget in the notebooks action area, specify “action-start” or “action-end” as the “type” attribute of the <child> element. Gtk.Notebook has a main CSS node with name notebook, a subnode with name header and below that a subnode with name tabs which contains one subnode per tab with name tab. If action widgets are present, their CSS nodes are placed next to the tabs node. If the notebook is scrollable, CSS nodes with name arrow are placed as first and last child of the tabs node. The main node gets the .frame style class when the notebook has a border (see Gtk.Notebook.set_show_border()). The header node gets one of the style class .top, .bottom, .left or .right, depending on where the tabs are placed. For reorderable pages, the tab node gets the .reorderable-page class. A tab node gets the .dnd style class while it is moved with drag-and-drop. The nodes are always arranged from left-to-right, regarldess of text direction. Creates a new Gtk.Notebook widget with no pages. Appends a page to self . menu_label (Gtk.Widget or None) – the widget to use as a label for the page-switch menu, if that is enabled. If None, and tab_label is a Gtk.Label or None, then the menu label will be a newly created label with the same text as tab_label ; if tab_label is not a Gtk.Label, menu_label must be specified if the page-switch menu is to be used. Appends a page to self , specifying the widget to use as the label in the popup menu. Removes the child from the notebook. This function is very similar to Gtk.Container.remove(), but additionally informs the notebook that the removal is happening as part of a tab DND operation, which should not be cancelled. Gets one of the action widgets. See Gtk.Notebook.set_action_widget(). the index (starting from 0) of the current page in the notebook. If the notebook has no pages, then -1 will be returned. Returns the page number of the current page. Gets the current group name for self . the menu label, or None if the notebook page does not have a menu label other than the default (the tab label). Retrieves the menu label widget of the page containing child . child (Gtk.Widget) – the child widget of a page of the notebook. the text of the tab label, or None if the widget does not have a menu label other than the default menu label, or the menu label widget is not a Gtk.Label. The string is owned by the widget and must not be freed. Retrieves the text of the menu label for the page containing child . Gets the number of pages in a notebook. Returns the child widget contained in page number page_num . Returns whether the tab label area has arrows for scrolling. See Gtk.Notebook.set_scrollable(). Returns whether a bevel will be drawn around the notebook pages. See Gtk.Notebook.set_show_border(). Returns whether the tabs of the notebook are shown. See Gtk.Notebook.set_show_tabs(). True if the tab is detachable. Returns whether the tab contents can be detached from self . Returns the horizontal width of a tab border. Returns the tab label widget for the page child . None is returned if child is not in self or if no tab label has specifically been set for child . the text of the tab label, or None if the tab label widget is not a Gtk.Label. The string is owned by the widget and must not be freed. Retrieves the text of the tab label for the page containing child . Gets the edge at which the tabs for switching pages in the notebook are drawn. True if the tab is reorderable. Gets whether the tab can be reordered via drag and drop or not. Returns the vertical width of a tab border. Insert a page into self at the given position. position (int) – the index (starting at 0) at which to insert the page, or -1 to append the page after all other pages. Insert a page into self at the given position, specifying the widget to use as the label in the popup menu. Switches to the next page. Nothing happens if the current page is the last page. Finds the index of the page which contains the given child widget. Enables the popup menu: if the user clicks with the right mouse button on the tab labels, a menu with all the pages will be popped up. Prepends a page to self . Prepends a page to self , specifying the widget to use as the label in the popup menu. Switches to the previous page. Nothing happens if the current page is the first page. page_num (int) – the index of a notebook page, starting from 0. If -1, the last page will be removed. Removes a page from the notebook given its index in the notebook. Reorders the page containing child , so that it appears in position position . If position is greater than or equal to the number of children in the list or negative, child will be moved to the end of the list. Sets widget as one of the action widgets. Depending on the pack type the widget will be placed before or after the tabs. You can use a Gtk.Box if you need to pack more than one widget on the same side. Note that action widgets are “internal” children of the notebook and thus not included in the list returned from Gtk.Container.foreach(). page_num (int) – index of the page to switch to, starting from 0. If negative, the last page will be used. If greater than the number of pages in the notebook, nothing will be done. Switches to the page number page_num . Note that due to historical reasons, Gtk.Notebook refuses to switch to a page unless the child widget is visible. Therefore, it is recommended to show child widgets before adding them to a notebook. Sets a group name for self . Notebooks with the same name will be able to exchange tabs via drag and drop. A notebook with a None group name will not be able to exchange tabs with any other notebook. Changes the menu label for the page containing child . Creates a new label and sets it as the menu label of child . Sets whether the tab label area will have arrows for scrolling if there are too many tabs to fit in the area. Sets whether a bevel will be drawn around the notebook pages. This only has a visual effect when the tabs are not shown. See Gtk.Notebook.set_show_tabs(). Sets whether to show the tabs for the notebook or not. Sets whether the tab can be detached from self to another notebook or widget. Note that 2 notebooks must share a common group identificator (see Gtk.Notebook.set_group_name()) to allow automatic tabs interchange between them. If you want a widget to interact with a notebook through DnD (i.e. : accept dragged tabs from it) it must be set as a drop destination and accept the target “GTK_NOTEBOOK_TAB”. 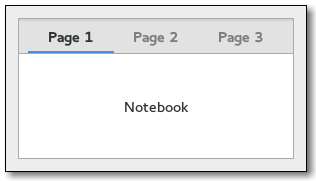 The notebook will fill the selection with a Gtk.Widget pointing to the child widget that corresponds to the dropped tab. Note that you should use Gtk.Notebook.detach_tab() instead of Gtk.Container.remove() if you want to remove the tab from the source notebook as part of accepting a drop. Otherwise, the source notebook will think that the dragged tab was removed from underneath the ongoing drag operation, and will initiate a drag cancel animation. If you want a notebook to accept drags from other widgets, you will have to set your own DnD code to do it. Changes the tab label for child . If None is specified for tab_label , then the page will have the label “page N”. Creates a new label and sets it as the tab label for the page containing child . Sets the edge at which the tabs for switching pages in the notebook are drawn. Sets whether the notebook tab can be reordered via drag and drop or not. a Gtk.Notebook that page should be added to, or None. The ::create-window signal is emitted when a detachable tab is dropped on the root window. A handler for this signal can create a window containing a notebook where the tab will be attached. It is also responsible for moving/resizing the window and adding the necessary properties to the notebook (e.g. the Gtk.Notebook :group-name ). the ::page-added signal is emitted in the notebook right after a page is added to the notebook. the ::page-removed signal is emitted in the notebook right after a page is removed from the notebook. the ::page-reordered signal is emitted in the notebook right after a page has been reordered. Emitted when the user or a function changes the current page. Group name for tab drag and drop.